When we put our faith in God, things really happen. The closure of abortion services in Central London’s Bedford Square is a fine example. Crisis Pregnancy volunteers have stationed themselves outside this abortion mill for 13 years. The hope that Good Counsel Network UK had for its closure has come to fruition. It is a remarkable victory with Heaven’s help. The combination of crisis pregnancy counselling, prayer vigils and raising public awareness has paid off. The fruits of consistent voluntary efforts and effective spiritual strategy are plain to see. God has delivered pro lifers in London a great victory. Crisis pregnancy volunteers are an effective antidote for women considering an abortion. Good Counsel Network in the UK have helped many pregnant mothers outside Bedford Square Abortion Clinic. The volunteers were a thorn in the side of the BPAS run termination centre. But what has been a constant source of support over the years has been the spiritual strategy employed at Bedford Square. Ireland pro-lifers can take a leaf from this case study. Cross party support pro-life groups helped to bring closure to the abortion services. This cross section of Catholic ministries and communities worked for 13 years in alternate stages to bring an end to abortion in Bedford Square. The backdrop of constant action was crisis pregnancy volunteers, counselling women in need of support. Saturday vigils began in the late 1990’s. Public novena’s began in 2005. A twice yearly 40 day for life vigil began in 2011. Bedford Square was consecrated to the Immaculate Heart of Mary that same year. Good Counsel Network UK began week day vigils in 2011. In 2012 a Bishop of West Minister arrived in Bedford Square as a show of public support for the Abortion closure demands. 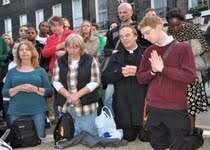 At the close of the 2013 forty day lenten vigil, BPAS announced the ending of abortion services in central London. Praise God for this wonderful victory, and may your desire to volunteer with Good Counsel become a reality. Tagged abortion service closure, Bedford Square consecrated to Our Lady, Bedford Square is abortion free, Counselling pregnant women, Crisis pregnancy volunteers, Good Counsel Network UK, pro-life volunteer, pro-life volunteering, Spiritual battle against abortion in the UK. Bookmark the permalink.